Vivian is a woman who has journeyed to far off lands as an acclaimed anthropologist, but her journey with her 13 year-old daughter, Lucy, takes her -- and the audience -- to places more intense than the most exotic locale. Damien Atkins' "Lucy," in only its second U.S. performance run, is visually, sonically and emotionally stunning. The first thing you notice, even before the play begins, is scenic designer Alexis Distler's striking set, an almost life-sized outline of a house. The design is sleek and stylized, almost evoking a child's drawing. When the actors are on stage, the set melts away, and its as if you're peeking in on a real family rather than watching a play. The script, directing and the acting, of course, makes this happen. All of the actors, under the direction of David Stradley -- Kate Eastwood Norris as Vivian, Andrea Green as Lucy, Charlie DelMarcelle as Lucy's father Gavin, Karen Peakes as Vivian's assistant Julia and Ross Beschler as Lucy's therapist -- fit into their roles extremely well. The script takes on the challenge of looking into the mind of an autistic girl by having Lucy speak to the audience as the play's narrator. Out of narration mode, she's written with the traits common to autism -- rocking, repeating phrases, recoiling from being touched -- a character that Atkins had researched with autism experts for more than two years. This is about Vivian's journey more than anything else, though. When her ex-husband Gavin approaches her about helping to raise Lucy, Vivian is on an archaeological dig and hasn't seen her daughter in years. She initially refuses to take charge of Lucy's care and therapy for a year while Gavin establishes a new marriage, but eventually gives in. Back home, she seems out of place, and she is thoroughly overwhelmed by Lucy. With the help of Julia and Lucy's therapist, she attempts to deal with her new life. Desperate to find answers, her once sparse home becomes filled with books as she searches for the reason Lucy is the way she is. Then something clicks (or snaps, depending on how you look at it). 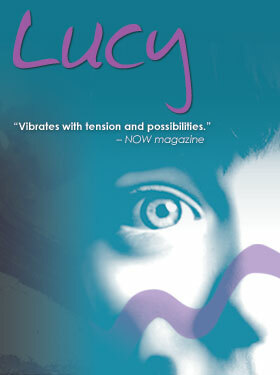 It's no longer Vivian's journey alone, but a journey she takes with Lucy. The result is alarming at times and exploding with emotion and visual surreality. "Lucy" brings forth different theories about autism, some you've likely heard before, and one in particular that is far from mainstream thinking, but it doesn't really "sell" any theory so much as it gives the viewer a lot to think about. "Lucy" runs through February 6. In addition, the gallery at DTC features the work MakeStudio.org artists Jermaine "Jerry" Williams, Bess Lumsden, Louis Middleton and Tony Labate. The Baltimore-based studio arts program supports emerging artists with disabilities. A nice companion to the play, the art show stands on its own and is worth spending some time with while you're there. Delaware's God of Love Takes on Oscar!